How to Build A Headboard From Pallets Very Quickly Without A Carpenter! 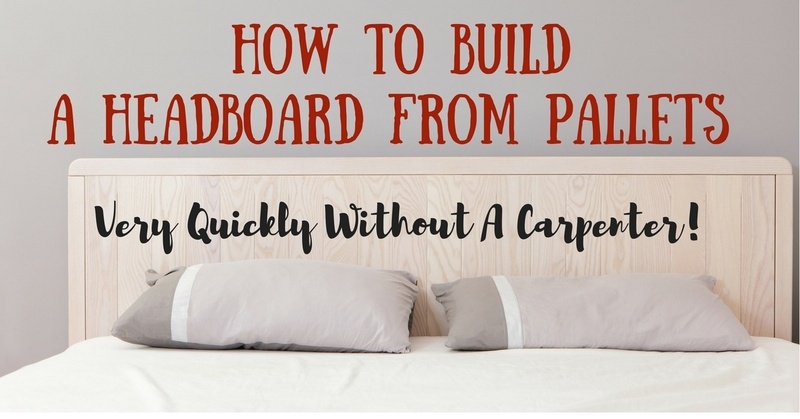 →How to Build A Headboard From Pallets Very Quickly Without A Carpenter! Interested in adding some rustic flair to your bedroom? Have a few pallets growing dust or mold in your garage or driveway? Turn them into a beautiful headboard with just eight easy steps! After working in the shipping department for a long time myself, I know companies are constantly replacing pallets with almost every shipment. Instead of letting that wood rot away in some landfill, I’d take home the “broken” pallets and turn them into the simple DIY decoration that adds a new element to the room they occupy. No need to hire a fancy carpenter or stroll through endless aisles at the department store for this project! With a few basic pallets, the right tools, and a little bit of hard work, you’ll have yourself a beautiful headboard over your bed in no time! Using the measuring tape, measure the base of the bed frame to the top of the mattress. This will be used in determining the length of the boards for the headboards. We recommend having the headboard be 32” higher than the mattress. f you desire, you can stick to one pattern of boards, or mix together different patterns for a more authentic feel. If you’re unsure of how to detach the boards, we’ve included a video link for you to get an idea of how to use the reciprocating saw on the pallets. With the measurements, you took before, mark the 1”-6” boards that you will use for the legs. 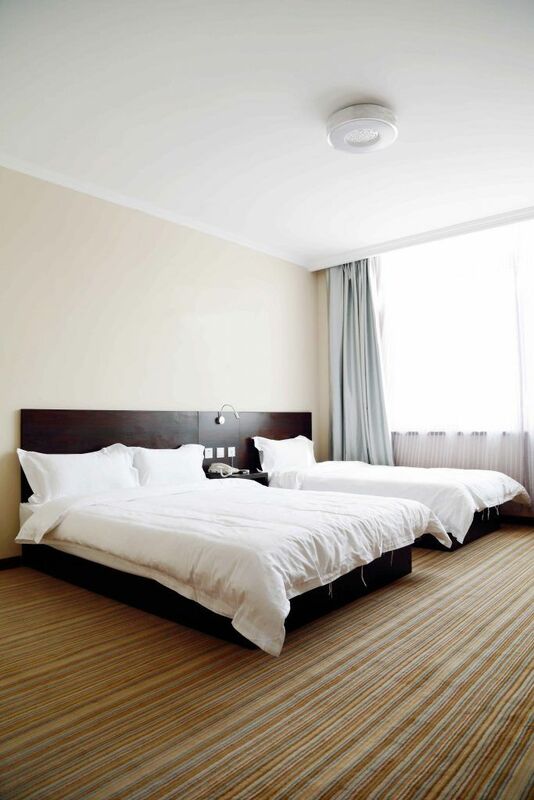 Take the height of the bed frame (with the mattress), and add 32” to your measurement. This will be the height of your headboard legs. 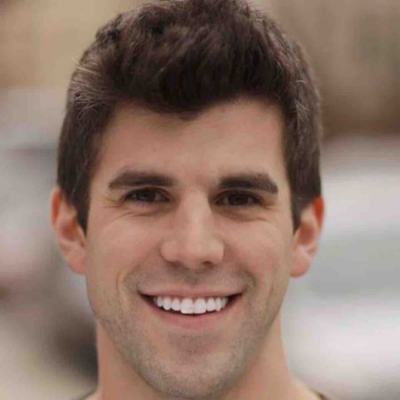 For example: If you measured your bedframe and mattress to be 28”, the height of your legs should be 60” (28 + 32 = 60). You should have two legs and one midway support. Mark where the mattress ends on the legs to know how far you should assemble the planks (should be 32”). 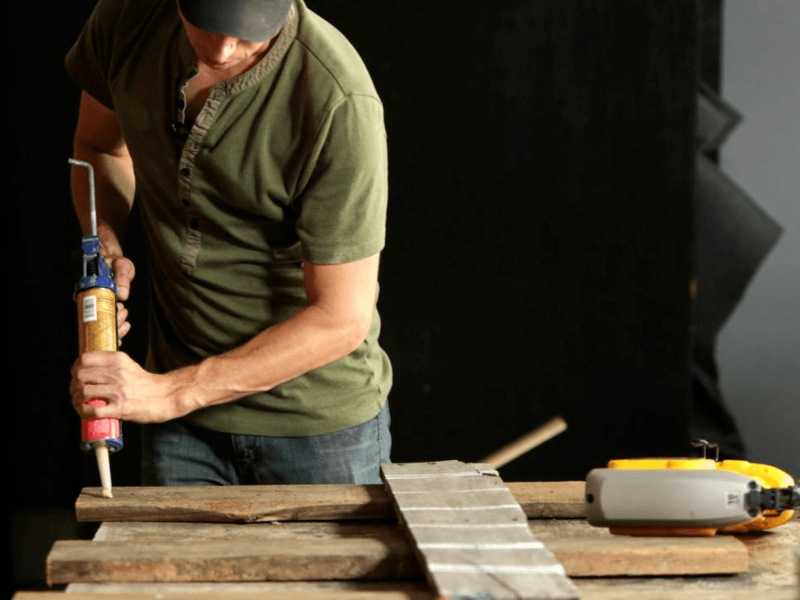 Before going into this step, we recommend that you take the salvaged planks from the pallet(s) and get a general idea of what you want the order or the pattern of the boards to be. This will save you time re-stripping planks off the legs when the design isn’t to your liking. Place the two legs parallel to each other on a flat, workable surface. 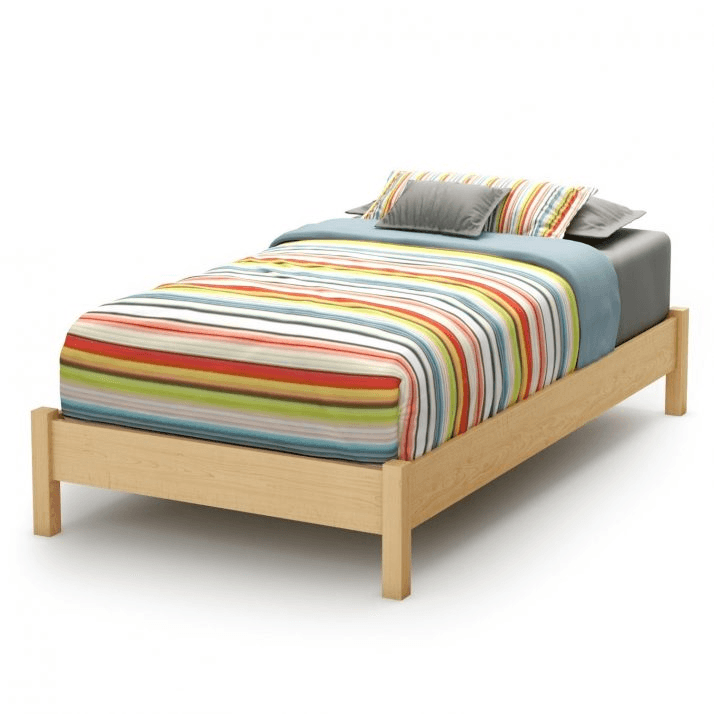 Make sure the end legs are positioned so that the planks for the headboard stick out 1” from each side of the legs. Once the legs are in position, measure the distance between the two legs and place the midway support leg in the middle of the two end legs. Apply construction adhesive to the legs where the plank is going to be placed (in this case, the top row plank). Place the top row plank on the adhesive and fasten the plank to the end legs and midway support leg with two nails on each If some planks are too curved to be placed straight on the legs, discard those planks. Continue to add planks in the pattern of your choice until the planks reach the 32” mark made before. If there are any splits or cracks in the boards near the ends, make sure to fasten a nail to each side of the split to prevent further damage to the plank. The planks should extend 1” off the end legs. Once all the planks are fastened to the legs and all the measurements have been checked, sand the planks using the orbital sander. 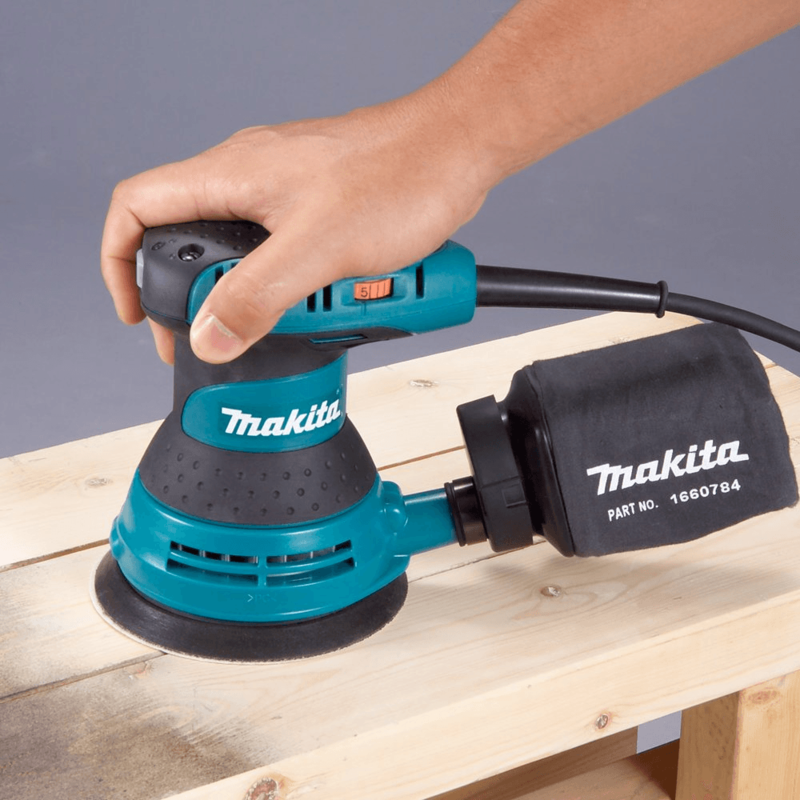 The rough areas of the planks should be sanded down to near-level with the 80-grit disc. Once all the planks are near level with each other, apply the 220-grit disc and sand each plank until smooth. Make sure to sand the edges of the planks as well to avoid splinters along the sides of the headboard. After the boards have been sanded down, apply a coat of shellac to the boards using your paintbrush or cotton rag. Once you’ve applied shellac to all the planks, wait 20-30 minutes, lightly sand the planks again to remove any unwanted lifted wood grain and apply a second coat. Apply the second coat thicker than the first coat, making sure to dig into the cracks and crevices of the planks to accentuate the life of your headboard and bring a lovely color out of the planks. Once the second coat of shellac is dry (approximately 20 minutes later), bring the headboard to the side of the bed facing the wall, drill approximately two holes (the size of the carriage screws) into the end legs, matching up with the bed frame, and fasten the bed frame and the legs using the carriage screws, approximately two screws per end leg. Alternatively, you can attach a cleat to the wall and hang the headboard from the cleat. For this project, we recommend constructing a French cleat system, since this type of cleat offers a wide range of usability, versatility, and structural support. 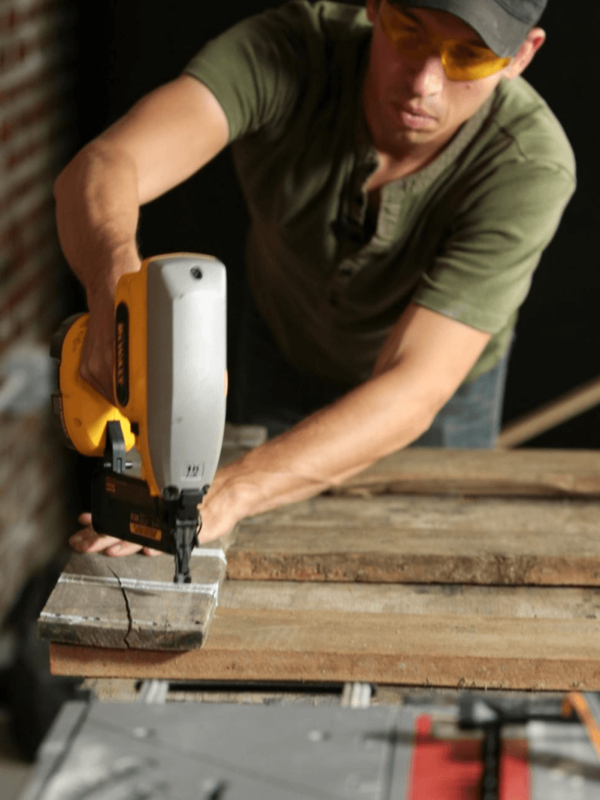 First, take your ¾” piece of plywood, and measure it to make sure that it is at least five inches wide and at least 30 inches long. Once you’ve double checked the measurements, make a 45˚ angle at the halfway point of the board.You will end up with two pieces, one that appears to be smaller than the other. Take the “smaller” of the two pieces and screw it to the top of the legs and midway support, using two screws for each leg. The 45˚ angle on the piece should be facing towards the floor. (you can do this with the knocking method: Make a fist and knock on the wall and listen for an echo. If you hear an echo, there is no support beam behind the wall and there is just sheetrock. Continue to knock along the wall until the echo disappears and you hear as if you’re knocking on a solid surface, like a table. Mark this point on the wall with your pencil. This is where the support beam will be and will guarantee your cleat to have more support than it would if you were to drill into sheetrock alone). After marking this point, drill four holes for the cleat and the wall, two for each end of the cleat. 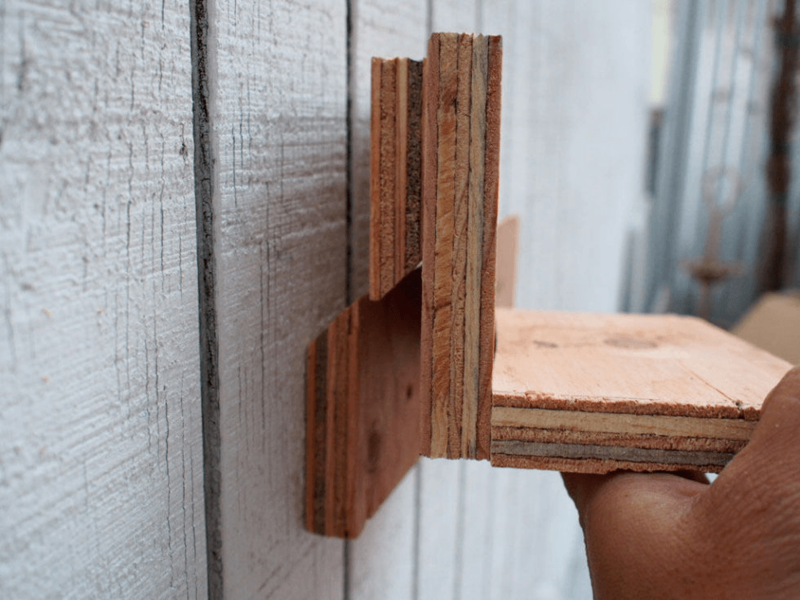 Fill each hole with a small amount of wood glue, then screw the cleat into the wall with the wood screws. The 45˚ angle on this piece should be facing towards the ceiling. After the “larger” cleat is attached to the wall and the “smaller” cleat is attached to the headboard, simply slide the headboard cleat on top of the wall cleat (as shown in the diagram above), until the two pieces are flush with each other. Test the cleat by gently pulling on the top of the headboard to assure that the screws are in tightly and that the headboard won’t collapse in the future. And there you have it! 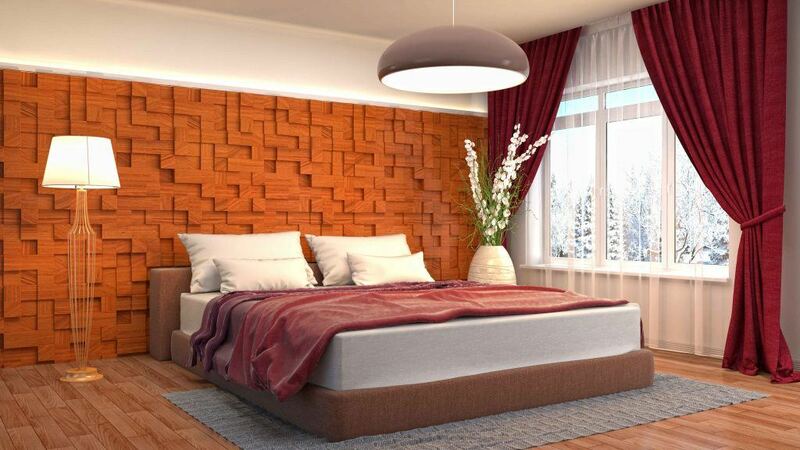 A perfectly recycled, eco-friendly headboard, perfect for any room! If you have any questions about any of the steps, feel free to shoot us an email for further clarification and detail into the specifics of the steps. Feel free to add any fabric or paint of your choice if the wooden style is not to your liking! I personally prefer the rustic style of the bare wood, but the beauty of this project is the versatility of the headboard. If the wood look isn't’ your thing, it’s only a matter of painting the headboard a color or design of your liking or stapling some fabric to the planks.